About a week after police apprehended a serial iPhone thief following a burglary at the San Luis Obispo Apple Store, a new batch of suspects allegedly snatched a couple iPhones and got away. At about 2:15 p.m. on Sunday, three suspects entered the SLO Apple Store and stole two black iPhone 8s, according to the San Luis Obispo Police Department. Police are circulating an image of the suspects obtained from surveillance footage. The suspects appear to be a woman, a girl and a boy. They may be related. Each of the three suspects appear to be wearing sweatshirts. 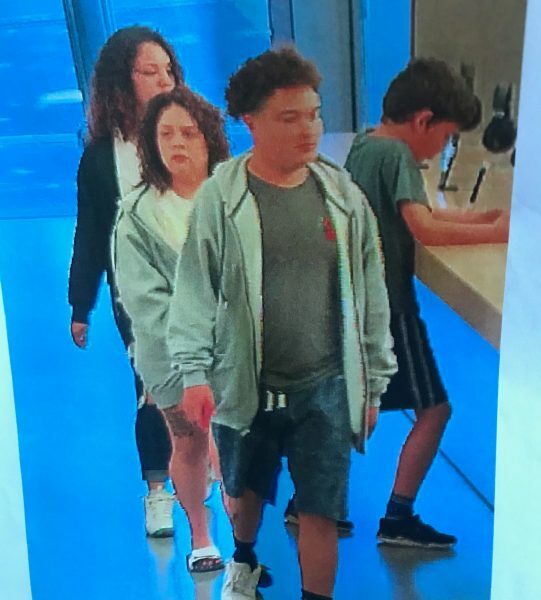 Police are requesting that anyone who recognizes the three individuals contact Officer Molina at (805) 594-8704. During the previous weekend, Aaron Marcuslee Searcy allegedly stole seven iPhones from the Apple Store and ran away. Shortly afterwards, officers caught Searcy and arrested him. Police say Searcy had committed similar thefts in 2017 and 2018 throughout Nevada and California, stealing about $90,000 worth of items.